Pakistan needs more help now and will need much more in the weeks and months ahead. This week the world — finally — began waking up to the devastation wrought by monsoon flooding that has already affected 20 million people. The United States and the United Nations deserve credit for raising the alarm and twisting arms. At a special General Assembly session Thursday, Secretary of State Hillary Rodham Clinton pledged to increase American aid by $60 million, to $150 million, and she pressed other nations to do their share. Secretary General Ban Ki-moon announced that donors had so far contributed $230 million, or about 60 percent of the United Nations’ appeal for disaster relief — up from less than 50 percent a few days earlier. The rest needs to be sent, swiftly. The European Union has increased its pledge to about $90 million, but needs to do more. So do Islamic nations. Saudi Arabia has pledged more than $110 million, mostly in donated goods, and Sudan and the Qatar Red Crescent are airlifting relief supplies. But other countries are writing meager checks. Given the disaster’s scale, the $10 million from Kuwait and the $5 million promised Friday by the United Arab Emirates hardly even qualify as symbolic. China, Pakistan’s longtime ally and the world’s second-largest economy, has pledged about $9 million in supplies and cash, a pittance. Pakistan’s longtime rival India — $5 million — needs to fully step up, too, and Pakistan needs to accept India’s help. There is no time to waste: The floodwaters are moving and the monsoon season will not end for weeks. 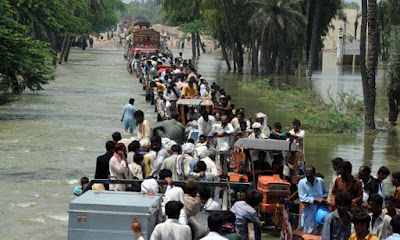 In 20 percent of Pakistan, the very web of society — people, homes, crops, livestock, roads, bridges — has been swept away. When the immediate crisis ebbs, all that will remain will be hunger, stagnant water, disease and the threat of chaos, which extremist groups will gladly exploit. One group of especially vulnerable survivors is Afghan refugees; more than 1.5 million were driven across the border by the war into now flood-stricken areas. The Pakistani government must give them the same support and protection as Pakistani citizens. Depending on what happens, this disaster could strengthen or severely weaken Pakistan’s dangerously weak civilian government. It could also improve this country’s standing among Pakistanis or make them even more skeptical or hostile. We are not sure which way this will go. We are sure that nothing good will happen — for Pakistan’s people or for the fight against extremists — unless the world rallies to Pakistan’s aid. Pakistan in trouble and need help for rebuild effected area.